The Monandock File #1: What’s In a Name? Monadh (Scottish) Ancient Gaelic for mountain or mountain mass. A common prefix for mountains throughout Scotland. Drummond, “Scottish Hill and Mountain Names” 1992. Nock. Gaelic for low hill. In Scot’s usage, an isolated, cone-shaped hill. Ibid. Monadnock. From 3,166′ Mount Monadnock in New Hampshire. A mountain or rocky mass that has withstood erosion and rises alone in a plain or peneplain. Webster’s New Riverside University Dictionary, 1988. In the Scottish Highlands, the southern watershed boundary of Loch Ness, is dominated by the 3,100′ Monadh Liath mountains. To the southeast, the Spey Valley is watched over by Monadh Mor, the Monadh Ruadh, and the Monadh Liath, the big, red, and gray mountains, respectively. In the Loch Archaig region, southwest of Loch Ness, there are four Monadh’s. In fact, the entire highlands were referred to as the “Monadh” thirteen Centuries ago. A highlands ruler who died in 560 AD was known as the King of Monadh. Even in today’s free-wheeling society, it is generally considered cheeky to challenge the person who “wrote the book.” The book, in this case, is The Annals of The Grand Monadnock, first published in 1936 by the Society for the Protection of New Hampshire Forests. And the person is no less than Monandock’s pre-eminent scholar, Allen Chamberlain. At issue is Chamberlain’s Chapter VII, Origin of the Name, and its opening sentence: “Beyond a doubt the English colonists adopted the name by which the mountain was known to the Indians.” Unfortunately, the remainder of Chapter VII fails to explain what other linguistic interpretations might have been discarded in coming to this conclusion. Instead, it is devoted to citations of supporting evidence from a variety of contemporary sources and a discussion of 22 variants of the spelling of Monadnock (notably not including “Monadh Nock.”. Chamberlain admits that much of his evidence is opinion and speculation. None of his proofs ever come close to clinching the argument _ leaving his “without a doubt” assertion pretty cheeky itself! Clearly, conventional usage, whether from Indian scholars or the U. S. Geological Survey, has no definitive relationship to origin. Chamberlain’s argument that the roots are Indian (rather than the word itself) appears to be drawn from Helen Cushing Nutting’s book of a decade earlier, “Monadnock Records of 3 Centuries”: man or mon, meaning “surpassing”, adn meaning “mountain”, and ock meaning “place” or place of the surpassing mountain. Consider whether the Indians, having free range of all the territory to the west and north, would be unlikely to regard Monadnock as “surpassing” among those heights we now refer to as the Green Mountains and the White Mountains. Curiously, Chamberlains’ very scholarly “Annals” contains not a single reference to Nutting’s earlier, and comprehensive published history. What do we know about this critical period from 1677 to 1703? Not only was the area unsettled west of the temporary settlement of Dunstable on the Merrimack, this was also the time of the intermittent French and Indian Wars with Massachusetts. And New Hampshire was part of Massachusetts until 1679. It was also the time when 3 successive British monarchs were having to draw heavily on Scotland and Ireland for their fighting men as a result of England’s relative prosperity _ a prosperity not shared among the Scots and the Irish. So, not only was there a strong contingent of Scotch-Irish among the colonists of the early 1700s, the same was true of whatever forces of the Crown were present to explore the land and thereby assert sovereignty in the late 1600s. Admittedly, both Chamberlain’s Indian argument and my own Scottish argument are circumstantial. While Chamberlain might be right, it seems that he was at least guilty of a rush to judgement. Somewhere in the British military archives of the last quarter of the 17th Century the answer may someday be found. But, until then, the Scot’s “Monadh Nock,” with its ancient roots and nearly identical meaning, can not be easily dismissed. In this period of intense exploration and mapping, officially motivated to encourage inland settlement, abetted by the commercial needs to settle the Masonian grants, and politically fueled by the separation of Massachusetts and New Hampshire, it seems reasonable that Monadnock was given its name by representatives of the Crown during the closing years of the 17th Century. Those representatives most likely included at least a few Scots with a marketing flair for using names that would appeal to their countrymen! There is a solution that satisfies both positions. My Indian colleagues, among western Nez Perce and eastern Penobscot, freely admit that, having no written language of their own, the Indians were not at all averse to adopting English and French names — “Indian” and “Nez Perce” being only two of literally hundreds of examples. The likelihood that the spoken word “Mondh Nock” could have been adopted by the Indians and subsequently re-adopted as Monadnock by Colonial settlers, offers an eminently reasonable solution to the puzzle. The similarity in sound, spelling, and meaning, cries out for explanation. This scenario provides one answer. There may be others including suspected cultural interaction between Indians and Gaelic speakers as early as the 11th Century. 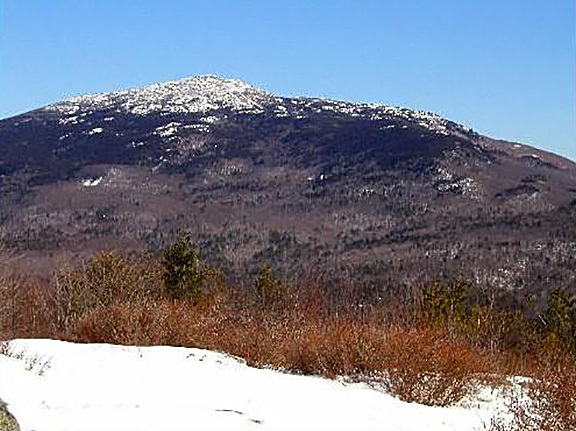 Monadnock’s multi-cultural background adds another intriguing element to this mountain which has fascinated so many for so long. Indian or Scottish? Does it really matter? For many, I suspect that the “so what” question is as large as Monadnock. But we do love a mystery don’t we? And, for something important enough to be part of our culture, perhaps we should be as curious as our forbears were adventurous. Simply because we may never know the answer is no reason to avoid the question. Once we begin to casually dismiss any aspect of our culture with “so what” then all of our culture becomes inconsequential. Chamberlain’s conclusion may yet be proven correct. But, his failure to recognize the inevitable Anglicization of the Indian’s language through three generations of contact prior to our available records will have to be dealt with. 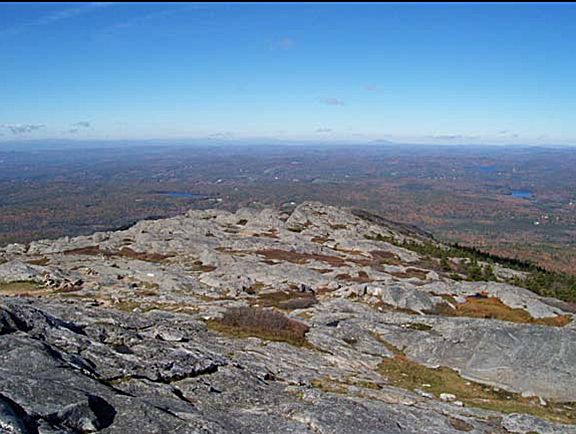 For the serious scholar, the Grand Monadnock’s enigmatic origins remain more of a mystery than are its geological beginnings. Chamberlain, Allen. 1936. Annals of the Grand Monadnock. Society for the Protection of New Hampshire Forests. Concord, NH. Nutting, Helen Cushing. 1925. Monadnock Records of Three Centuries. Stratford Press, NY. Drummond, Peter, 2002. Scottish Hill and Mountain Names. 214 pages. The Scottish Mountaineering Trust.